With all due respect to the Jackson Five, sometimes A-B-C is not easy as 1-2-3. We’re talking NGL or LPG or LNG – abbreviations for gases that can trip up even a seasoned energy market veteran. Let’s take a moment to straighten out our definitions for these important gas terms and then familiarize ourselves with common uses for this hydrocarbon alphabet soup. There will be a very easy-to-follow graphic that you can print out and ponder at your leisure, too. We’ve got your back! Propane and butane are the Big Kahunas of the LPG market. They are also classified as NGLs. Yet, not every NGL can sport a nametag that reads, “Hi, my name is LPG.” Awkward. What’s more, you need to keep an eye on autocorrect when you type LNG, because LNG is NOT an NGL. This is a group of hydrocarbons including ethane, propane, normal butane, isobutane and pentanes plus, AKA natural gasoline. They are a byproduct of natural gas processing and refining. NGLs are removed from natural gas at natural gas processing plants as a combined stream, often called raw make or y-grade. This combined stream is then fractionated (separated) to produce products ethane, liquefied petroleum gases (propane and butanes) and natural gasoline. Though they are derived from a vaporous stream, natural gas liquids are kept in a liquid state for storage, shipping and consumption. Three of the purity natural gas liquids we mentioned above – propane, normal butane and isobutane – get the double distinction of being sold as a Liquefied Petroleum Gas. The “petroleum” part gets thrown in because these products can also be derived from the crude oil refining process. The rest is from the natural gas mix we just mentioned. These gases may be marketed individually or mixed. They have their own global distribution chain and are used the world over for domestic and commercial purposes. LPG fuel can also be used as autogas in cars that can burn it. But, it’s important to remember that only propane, normal butane and isobutane fall into this category. So, not every NGL is an LPG. Last stop is LNG, which isn’t an NGL or an LPG. LNG stands for Liquefied Natural Gas or Liquid Natural Gas and, as the name implies, it is traditional natural gas, which has been cooled to the point of liquefaction. Fun fact: liquefied natural gas takes up about 1/600th the space that the same amount of gaseous natural gas would take up. Methane is the primary component of natural gas. It’s what is left over after most of the natural gas liquids are stripped out from the natural gas stream. When natural gas is cooled to minus 161 Celsius (brr!) it becomes a liquid and can be sold as LNG, a fuel with domestic, international, industrial and transportation uses. This image below walks you through what we just discussed. Note that methane is a dry, or natural gas, but not an NGL or an LPG. It stands alone as LNG. To recap, the NGLs are comprised of ethane, propane, normal butane, isobutane and natural gasoline. They are created by being removed from a natural gas. Note: Ethane can be left in the natural gas stream up to a certain amount. Lastly, note the three traditional LPGs: propane, normal butane and isobutane. They fall under the larger umbrella of NGLs. Download the infographic by clicking here. Now that we know what they are, what do they do? Propane is used worldwide as a heating and cooking fuel (fire up that grill) and as engine and industrial fuel. But, it also has use as a petrochemical feedstock and is a primary building block for many of the plastics we use every day (ex: plastic bags and milk jugs). Normal Butane is used to blend into motor gasoline during certain times of the year. It’s also petchem feedstock for ethylene and butadiene, which is used to make polymers such as synthetic rubbers. Normal butane also is used to make the third LPG, isobutane, through a process called isomerization. Isobutane can also be fractionated from the gas stream and is also a crude oil refinery process byproduct. Isobutane is used to make alkylate, an octane-booster in gasoline. That’s key for premium-grade blends. It’s also used as a gas for refrigeration systems and as an aerosol propellant. Ethane’s chief use is as a feedstock for ethylene production. Again, this is key in the production of plastics. E/P Mix is a blend of ethane and propane. The typical blend is 80% ethane and 20% propane. But some chemical companies require special blends. Chemical companies, you say? Yes, that’s because, like ethane, E/P Mix’s primary use is the creation of ethylene. Natural Gasoline is also a petchem feedstock, but its other uses are a little more varied. Years ago, this material was put directly into gas tanks in cars, hence the natural “gas-oline.” Today, that’s not the case, but natural gasoline is indeed used to blend into motor gasoline. Natural gasoline is also used as a thinning agent, or “diluent,” to make it possible for oil sands (containing bitumen, used to make gasoline and other petroleum products) to pass through pipelines for production. We saved the best use for last! Ethanol producers often use natural gasoline as a “denaturant” to make fuel-grade ethanol (which is, after all, alcohol) undrinkable. That’s one heck of a cocktail mixer! Lastly, LNG, once warmed, reverts to natural gas for heating, cooking, electricity generation and industrial use. Moreover, when kept in its liquid form, LNG finds a home as a transportation fuel alternative. 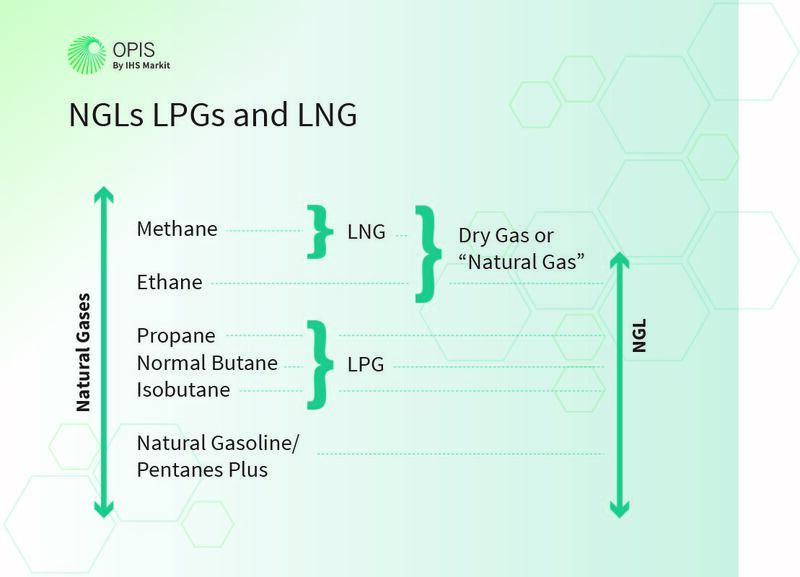 So there you have it… A down and dirty overview on what NGL, LPG and LNG mean and what they do. Ready for more? Check out our online eLearning course to take you further inside this dynamic market. NGL Supply & Market Basics is a self-paced eLearning course you can take online anytime, anywhere. Sign up now and received a $200 discount on your online course. As the official spot benchmark, every gallon of propane, butane, ethane and natural gasoline in the U.S. market is tied to OPIS pricing. 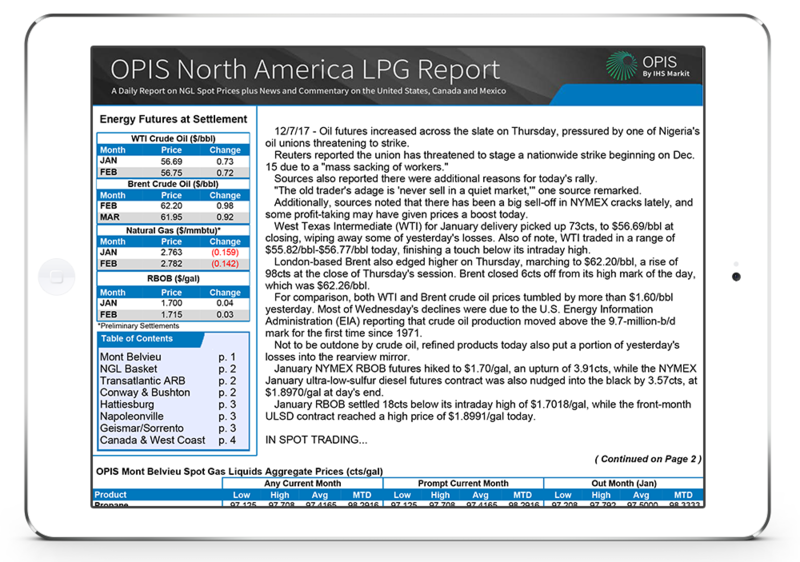 OPIS covers U.S. natural gas liquids spot markets on a full-day basis, canvassing an unparalleled source pool to provide pricing you can trust.